Although single mountains exist, most occur as a group, called a mountain range. A group of ranges that share a common origin and form is known as a mountain system. A group of systems is called a mountain chain. Finally, a complex group of continental (land-based) ranges, systems, and chains is called a mountain belt or cordillera (pronounced kordee-YARE-ah). The greatest mountain systems are the Alps of Europe, the Andes of South America, the Himalayas of Asia, and the Rockies of North America. Notable single peaks in these systems include Mont Blanc (Alps), Aconcagua (Andes), Everest (Himalayas), and Elbert (Rockies). The Himalayas is the world's highest mountain system, containing some 30 peaks rising to more than 25,000 feet (7,620 meters). Included among these peaks is the world's highest, Mount Everest, at 29,028 feet (8,848 meters) above sea level. North America's highest peak is Mount McKinley, part of the Alaska Range, which rises 20,320 feet (6,194 meters). Mountains, like every other thing in the natural world, go through a life cycle. They rise from a variety of causes and wear down over time at various rates. Individual mountains do not last very long in the powerfully erosive atmosphere of Earth. Mountains on the waterless world of Mars are billions of years old, but Earth's peaks begin to fracture and dissolve as soon as their rocks are exposed to the weathering action of wind and rain. 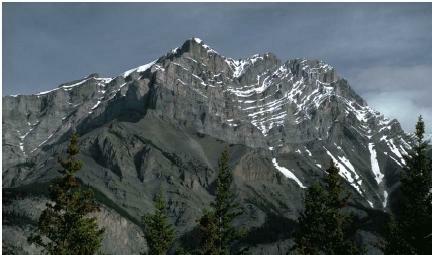 This is why young mountains are high and rugged, while older mountains are lower and smoother. Belt: Complex group of continental mountain ranges, systems, and chains. Chain: Group of mountain systems. Crust: Thin layer of rock covering the planet. Plate tectonics: Geological theory holding that Earth's surface is composed of rigid plates or sections that move about the surface in response to internal pressure, creating the major geographical features such as mountains. System: Group of mountain ranges that share a common origin and form. Mountain building (a process known as orogeny [pronounced o-RA-je-nee]) occurs mainly as a result of movements in the surface of Earth. The thin shell of rock covering the globe is called the crust, which varies in depth from 5 to 25 miles (8 to 40 kilometers). Underneath the crust is the mantle, which extends to a depth of about 1,800 miles (2,900 kilometers) below the surface. The mantle has an upper rigid layer and a partially melted lower layer. The crust and the upper rigid layer of the mantle together make up the lithosphere. The lithosphere, broken up into various-sized plates or sections, "floats" on top of the heated, semiliquid layer underneath. The heat energy carried from the core of the planet through the semi-liquid layer of the mantle causes the lithospheric plates to move back and forth. This motion is known as plate tectonics. Plates that move toward each other are called convergent plates; plates moving away from each other are divergent plates. When continental plates converge, they shatter, fold, and compress the rocks of the collision area, thrusting the pieces up into a mountain range of great height. This is how the Appalachians, Alps, and Himalayas were formed: the rocks of their continents were folded just as a flat-lying piece of cloth folds when pushed. When a continental plate and an oceanic plate converge, the oceanic plate subducts or sinks below the continental plate because it is more dense. As the oceanic plate sinks deeper and deeper into Earth, its leading edge of rock is melted by intense pressure and heat. The molten rock then rises to the surface where it lifts and deforms rock, resulting in the formation of volcanic mountains on the forward edge of the continental plate. The Andes and the Cascade Range in the western United States are examples of this type of plate convergence. The longest mountain range on Earth is entirely underwater. The Mid-Atlantic Ridge is a submarine mountain range that extends about 10,000 miles (16,000 kilometers) from Iceland to near the Antarctic Circle. The ridge is formed by the divergence of two oceanic plates. As the plates move away from each other, magma (molten rock) from inside Earth rises and creates new ocean floor in a deep crevice known as a rift valley in the middle of the ridge. On either side of the rift lie tall volcanic mountains. The peaks of some of these mountains rise above the surface of the ocean to form islands, such as Iceland and the Azores. Other mountains on the planet form as solitary volcanic mountains in rift valleys on land where two continental plates are diverging. Mount Kilimanjaro, the highest point in Africa, is an extinct volcano that stands along the Great Rift Valley in northeast Tanzania. The highest of its two peaks, Kibo, rises 19,340 feet (5,895 meters) above sea level. The erosive power of water on plateaus can also create mountains. Mesas, flat-topped mountains common in the southwest United States, are such a case. They form when a solid sheet of hard rock sits on top of softer rock. The hard rock layer on top, called the caprock, once covered a wide area. The caprock is cut up by the erosive action of streams. Where there is no more caprock, the softer rock beneath washes away relatively quickly. Mesas are left wherever a remnant of the caprock forms a roof over the softer rock below. Mesa Verde in Colorado and the Enchanted Mesa in New Mexico are classic examples. California, where tall redwood forests cover the ocean-facing side of the mountains and Death Valley lies on the lee side. Can you Explain directly how the Himalayas and Andes Mountains are formed??? I have been Research in the Ramayana of Lnka and sethu(bridge) these are two points are to on the ocean . these are are moving the reason of The Lanka to move to reach to Sri lanka, Ana The sethu(bridge ) is to move to reach in between India nad Srilanka . thats way i wanted to in middle of lanka and sethu is moving for period of distance . I requested ot you details of above my research project help me. I have been research the Valmiki Ramayana In that Ramayana Middle of ocean one mountain is their . This mountain contraction of Lanka that period of 17,89,000 years ago. That mountain to move for effect of waves knock and magnetic effect to move that mountain. i have expected The continental c rectal to formation 8 elements these are crystals under the mountains store. these are only crestless are not to move add by mud now started to move this period and upper side to effect of no of waves types and magnetic energy to storage in middle of ocean the energy to move and attack the mountain this are attack at a time the mountain to go slowly i have expected . What is a continental Margin? Describe tha two types..